Asparagus is one of those classic (almost) impossible-to-pair ingredients, but Austrian Grüner Veltliner is up for the challenge. This dish is essentially vegan, but to up the umami quotient I love adding a sprinkling of Japanese furikake seasoning, which is a blend of seaweed, toasted sesame seeds and ground dried fish. If you can’t find it, sprinkle on some seaweed flakes or snipped nori. To turn this dish into a heartier meal, you can top it with an egg or stir in some rotisserie chicken. 1. In a large pot of boiling salted water, cook the quinoa until it is tender and the tails are visible, about 20 minutes. Drain. 2. Meanwhile, in a large skillet, heat the olive oil. Add the white parts of the ramps and cook over high heat, stirring constantly, until fragrant and softened, about 1 minute. Add the asparagus and cook, stirring, until barely crisp-tender, 3 to 5 minutes, depending on the thickness of the asparagus. Add the snap peas and cook until hot, 2 minutes. Add the quinoa and cook until incorporated and heated through, 1 to 2 minutes. Remove the skillet from the heat and stir in the lemon juice. 3. 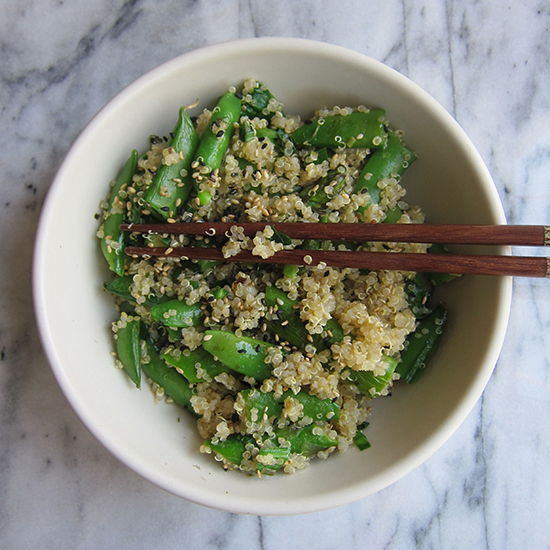 Transfer the quinoa sauté to bowls, sprinkle with furikake seasoning and serve. Wine: A light, bright Grüner Veltliner, such as 2012 Erdenlied. One Serving 284 cal, 9 gm fat, 1.2 gm sat fat, 42 gm carb, 7.5 gm fiber, 11 gm protein.